Miniature portrait of Marie Antoinette, gouache on ivory, in an ormolu frame. 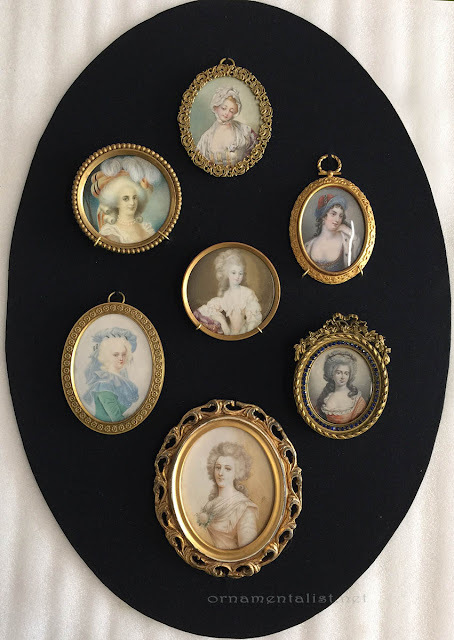 Some years ago I began a journey, cleaning and restoring a large collection of miniature portraits that had belonged to my great-grandmother. A group of these had been set aside for my niece, Elizabeth, and long after I had finished cleaning them, I was still struggling with a way to arrange them in some kind of display, to both protect and present them in a relevant way. Miniature collection, cleaned and restored, and arranged for framing! Enter the wonderful Christine Lando. 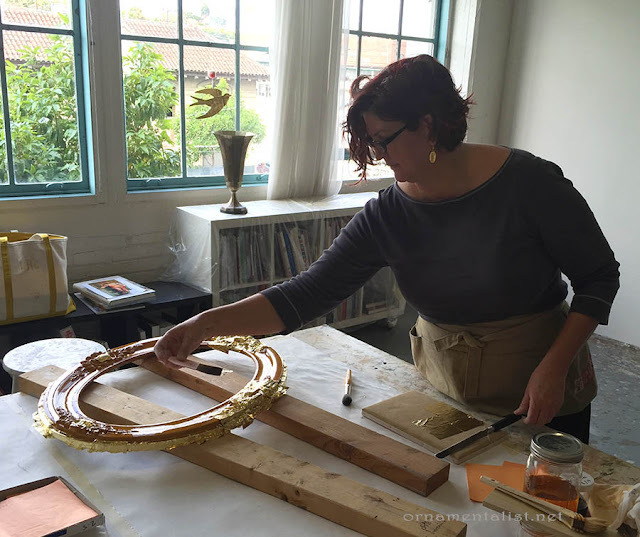 Christine is an artist and archival framer, with whom I share my studio in San Francisco. 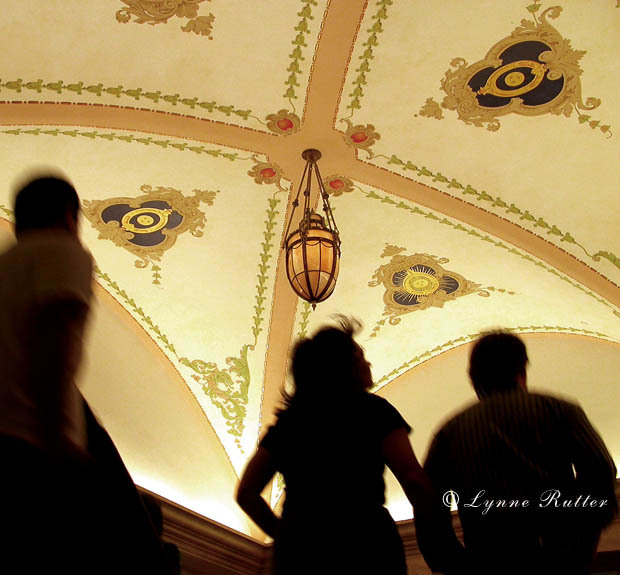 She located a vintage oval frame with convex glass in which to set the collection. The frame had been spray over with gold-brown radiator paint and its glass had been glued in place with gobs of silicone caulk. 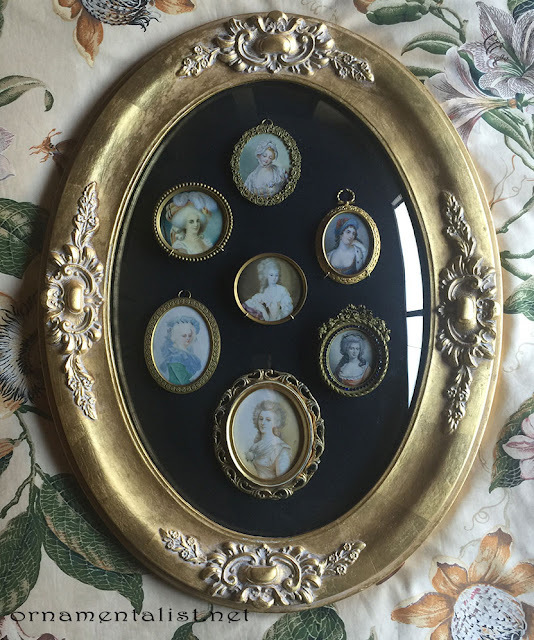 While Christine studied the grouping of the miniatures and devised ways to attractively mount them in a reversible, museum-quality manner, I set about cleaning and re-gilding the frame itself. Christine Lando, framer extraordinaire, made careful notes in preparation for mounting this display of miniature portraits. The frame was re-gilded using composition leaf, on a base of casein gesso made by Sinopia. This was then shellacked, antiqued, and waxed to make a nice vintage "French" looking finish. The finished piece makes a very sweet display for this collection, and a nice decorative addition to my newlywed niece's new home. Seven beauties presented in a vintage gilt frame with convex glass. Soon after completing this display, I decided to make a similar heirloom as a gift for my sister. To compliment the goth aesthetic of her home, I chose three portraits out of the collection that are just a tad creepy. Christine created a shadowbox frame out of her personal stash of Italian mouldings, this one with a verdigris guilloche pattern. 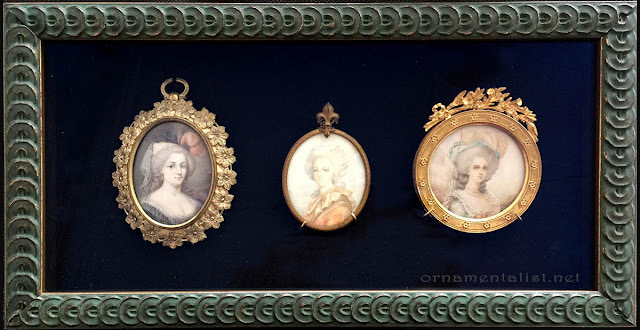 Included in this trio is my favorite big-eyed portrait of Marie Antionette, beautifully painted and set in an ormolu frame (see first image.) This piece had a noticeable crack in it, damage that occurred after the frame had been back-stuffed with paper and cardboard (to keep it tight or something) which then got wet and swelled, pushing the fragile ivory substrate into the pillowed crystal front until it snapped. Someone then glued it to a piece of paper and stuffed it back into its frame. After removing all the garbage from the back of the painting, I set it in a press for a few days to flatten it, and then cleaned it and restored just a few tiny areas. It is stable and won't get any worse, and in this setting, I think the remaining fracture adds a certain je ne sais quoi. 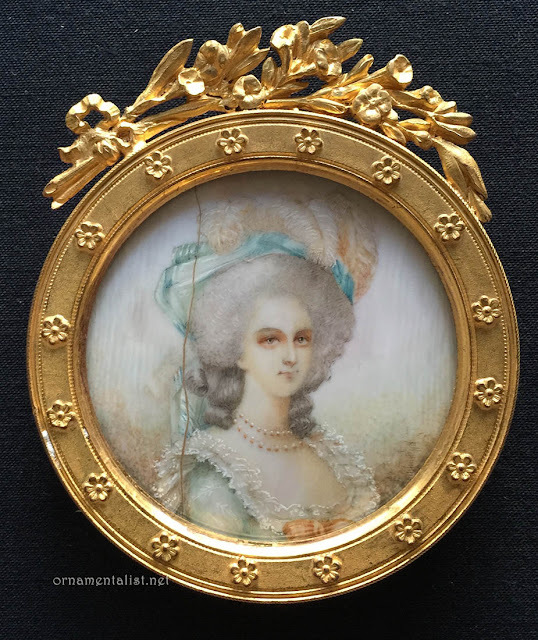 See this previous post for up-close photos of these miniature portraits. 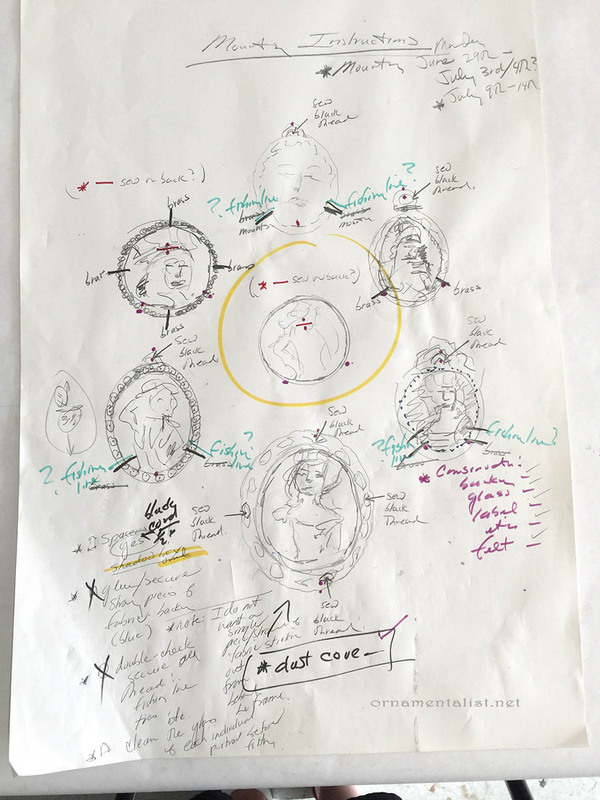 Have something special needing an inventive framing solution? Oh my, how wonderful! 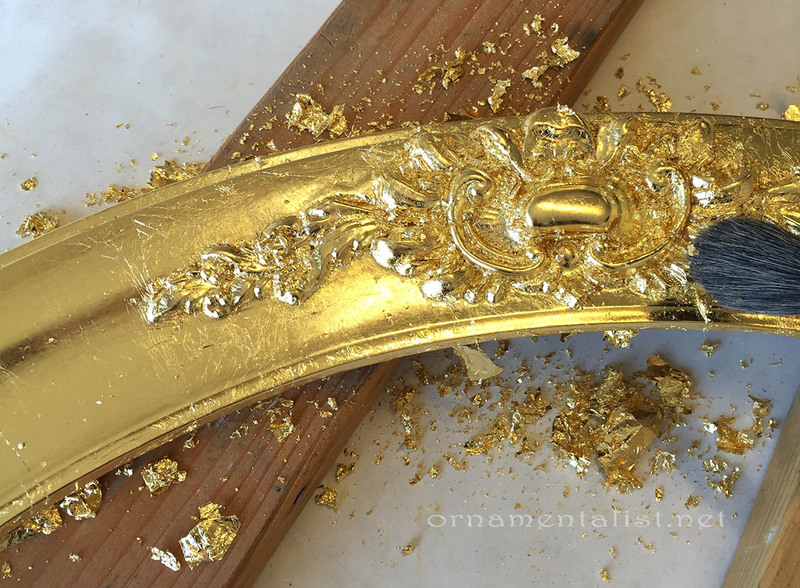 I love your restoration on the oval frame- the overall collection is covet worthy. Thank you Auntie Lynne for sharing. happy to! thanks for visiting! Love the verdigris shadow box. The color is WOW! How Beautiful! 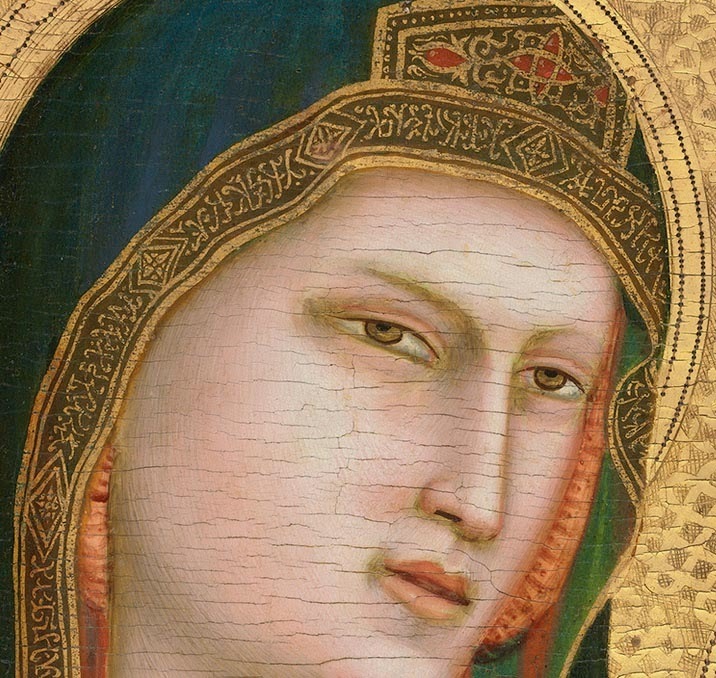 The miniatures are fascinating and lovely each one alone... but together they are so much more! I love the arrangement and the frame you found for them is perfect! As is the "goth" collection.... what a great idea to gather the "strange" ones together! Beautifully done, what lucky recipients!